The Union Budget this year was not full of pleasant surprises-as it was last year-for individual tax payers and small investors. Nonetheless, it proposed many big and small changes in tax rules that will impact your portfolio. We take you through the various tax proposals in the Budget that require you to rework your portfolio and suggest the best ways to carry out these changes. 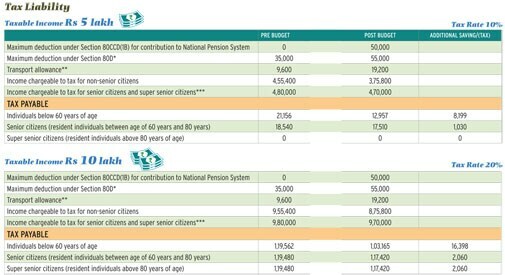 You can claim an extra tax deduction of Rs 50,000 from next financial year if you invest in the National Pension System (NPS). This will help those in the highest tax bracket save Rs 15,450 a year. This means NPS now offers three benefits for those who invest through their employer. Other than this new Rs 50,000 deduction, employee contribution till 10% of basic salary is eligible for deduction within the Rs 1.5 lakh Section 80C limit. The matching employer contribution is eligible for a separate deduction. So, if your annual basic salary is Rs 5 lakh and you subscribe to corporate NPS, you can claim a deduction of Rs 1.5 lakh from NPS alone-Rs 50,000 employee contribution (up to 10% of salary) under Section 80CCD(1), Rs 50,000 employer contribution under Section 80 CCD(2), and another Rs 50,000 under the newly-introduced Section CCD(1B). Apart from this, you can claim another Rs 1 lakh deduction under Section 80C, whose limit was increased to Rs 1.5 lakh in last year's Budget. The Budget also proposes to give salaried people the option to choose between Employee Provident Fund (EPF) and NPS. This means contribution to EPF will no longer be mandatory. The government will come out with further instructions-either through the PFRDA or the EPFO-on how employees can choose between the two. PFRDA is Pension Fund Regulatory and Development Authority. EPFO is Employee Provident Fund Organisation. "The implementation part will be cleared later. The employee will most likely have to get a Permanent Retirement Account Number from the pension regulator and give it to the employer. The employer will then deposit both its and employee's contribution to the NPS account," says Srikanth Meenakshi, director, fundsindia.com. The aim of these changes is to encourage people to opt for NPS. The scheme has failed to catch the fancy of corporate employees and voluntary subscribers for whom it was thrown open in 2009. If you are an NPS investor and have exceeded the Rs 1.5 lakh limit under Section 80C, you will become automatically eligible for the new deduction of Rs 50,000. Check if you are using the Rs 2 lakh limit fully- Rs 1.5 lakh under Section 80CCD (1) and Rs 50,000 under Section 80CCD (1B). If not, invest an additional Rs 50,000 to fill the gap in the Rs 1.5 lakh limit. For example, if the amount invested in Section 80C instruments is Rs 1.6 lakh, including Rs 30,000 in NPS, you can claim deduction on the whole amount instead of Rs 1.5 lakh. However, given the limit of Rs 2 lakh, including Rs 50,000 in NPS, you can increase contribution to NPS by Rs 20,000 and put the rest Rs 20,000 in instruments such as public provident fund (PPF) that are eligible for deduction under Section 80C. Corporate NPS subscribers can invest an additional Rs 50,000 over and above what they are already contributing. However, if you have not opened an NPS account, do not start just because of the additional tax benefit. You must weigh the pros and cons of NPS and compare it with the other options. NPS offers higher equity exposure-up to 50%. This gives it an edge over EPF. It is also more flexible than EPF in terms of portfolio composition. However, it is not easy to access NPS money. One can withdraw only 60% money at 60. The rest 40% has to be used to buy annuity. Withdrawal up to 25% of the corpus is allowed for medical treatment, higher education and marriage of children and purchase of house. But first withdrawal is allowed only after 10 years. Only three partial withdrawals are allowed during the whole tenure. There has to be a gap of at least five years between each withdrawal. "Lack of liquidity is a big negative. One must have access to the full money after maturity. Let the investor decide what he or she wants to do with the money. I always suggest people to invest in simple and flexible instruments. Discipline and not compulsion is the key to long-term gains," says Shilpi Johri, a certified financial planner and head of Arthashastra Consulting. Tax on withdrawal is another concern, though PFRDA Chairman Hemant Contractor told Money Today that the regulator has raised the issue and the government has promised to examine it. However, even if the lump sum received at retirement (60% of the corpus) is made tax-free, annuity payments will continue to be added to the income and taxed. However, some financial planners say this may not be a big issue. "There is tax on withdrawal, which I believe will go. Apart from that, the basic exemption will be so high in future that annuities will become tax-free," says Kartik Javeri, director, Transcend Consulting. Most financial planners say that mutual funds are the best way to save for retirement. The reason is that they offer a wide variety of schemes with different levels of allocation to equities and debt. Liquidity, too, is not an issue. As EPF money is invested in debt and offers a fixed return, one can invest in diversified equity funds and balance the portfolio. "Don't get swayed by the Rs 50,000 tax deduction. Contribute to NPS only if you have sufficient cash," says Surya Bhatia, certified financial planner and principal consultant, Asset Managers, a financial advisory firm. Bhatia says NPS allows only 50% equity exposure, which may not be enough for people who are young and can afford to take more risk. But someone in late 40s and in the 30% tax bracket can avail of this additional benefit as in his case the money will be locked in for a shorter period. He will save Rs 15,450 a year. The deduction on premium paid for health insurance has been increased from Rs 15,000 to Rs 25,000. For senior citizens, the increase is from Rs 20,000 to Rs 30,000. Therefore, one can now claim a total deduction of up to Rs 55,000 as against Rs 35,000 earlier. This will help those in the 30% tax slab save up to Rs 6,180 a year. Senior citizens above 80 years of age, called very senior citizens, who are not covered by health insurance, are now eligible for a deduction of Rs 30,000 for healthcare spendings. Deduction for expenditure on treatment of certain critical illnesses has been increased from Rs 60,000 to Rs 80,000 for very senior citizens. The illnesses covered are malignant cancer, AIDS, dementia, hemophilia, thalassaemia, Parkinson's disease and renal failure. Deduction for those suffering from disability or paying for treatment of disabled dependents has also been increased by Rs 25,000. Health-care costs have risen sharply over the years. Therefore, you need a comprehensive cover for you and your family members. Can the increase in deduction limit be an incentive to buy health insurance? "We see a spike in the number of health insurance policies being bought in the last couple of months of the financial year. This is proof that tax deduction is a big consideration for buying health insurance," says B Subrahmanyam, head of health & commercial underwriting, product development and reinsurance, Bharti Axa General Insurance. A Rs 3 lakh family floater for a family of two adults and two children, with the oldest member below 35, costs Rs 10,000-15,000. A Rs 5 lakh cover costs Rs 15,000-20,000. The increase in deduction is clearly an incentive to shift to the Rs 5 lakh cover. "We expect customers to increase sum insured taking into account the high medical inflation," says Antony Jacob, chief executive officer, Apollo Munich Health Insurance. The cover can be increased at the time of policy renewal. You can also buy a top-up cover. It kicks in after you exhaust the base cover and is cheaper. A top-up cover of Rs 10 lakh costs less than what you will pay for increasing your base cover from Rs 3 lakh to Rs 10 lakh. For example, a Star Health family floater policy for a family of two adults and two children (with eldest member less than 35) costs Rs 10,511 for a Rs 3 lakh cover and Rs 17,483 for a Rs 10 lakh cover. If instead of increasing the base cover from Rs 3 lakh to Rs 10 lakh one buys a top-up cover of Rs 10 lakh, taking the total cover to Rs 13 lakh, the additional cost is just Rs 6,405. However, the top-up cover comes into play only when the threshold decided at the time of buying the cover is reached. If the threshold is Rs 3 lakh and the top-up cover is Rs 10 lakh, the latter will kick in only when the one-time hospitalisation cost crosses Rs 3 lakh. You can also buy a critical illness cover. It is only for adults and covers serious diseases such as cancer and kidney failure. It pays a lump sum on diagnosis of diseases that are covered. A critical illness policy of Rs 10 lakh for two adults costs Rs 5,000-6,000. There are also disease-specific covers such as for diabetes and surgery which can be used as add-ons. 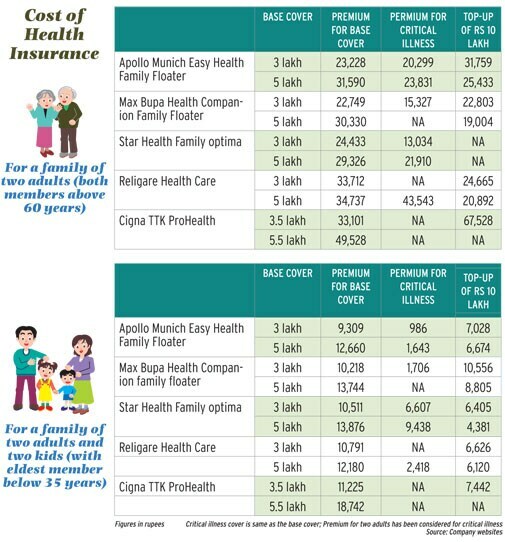 "The average size of health insurance is Rs 5 lakh. With increase in tax deduction, people will feel encouraged to opt for a higher cover, which is the need of the hour given the escalating health-care costs and incidence of lifestyle illnesses. Since these tax benefits are for indemnity top-ups as well as fixed benefit critical illness plans, one can expect a surge in the number of consumers opting for these," says Somesh Chandra, chief operations officer and chief quality officer, Max Bupa Health Insurance. The Sukanya Samriddhi Yojna, launched this January to encourage people to save for girl child's education and marriage, has been made totally tax-free. This means both interest income and money received on withdrawal will not be taxed. The scheme was already eligible for deduction under Section 80C. This brings it on a par with the popular PPF as far as taxation is concerned. However, it is offering a higher return of 9.1% compared to PPF's 8.7%. According to AK Chauhan, joint director and head of department, National Savings Institute, the Sukanya Samriddhi Yojna will continue to get preferential treatment. The National Savings Institute gives inputs to the Ministry of Finance in designing and launching new products. The account can be opened by parents and guardians of girl children (maximum two) up to 10 years of age. The maximum amount that can be invested is Rs 1.5 lakh a year. 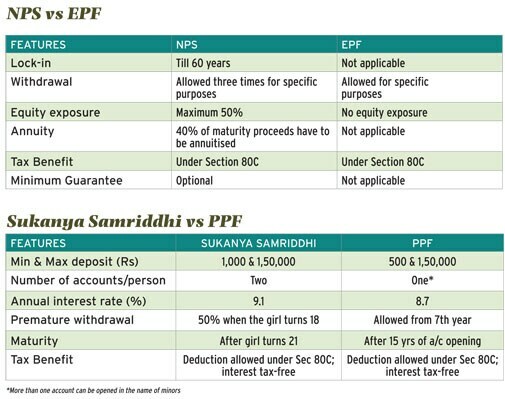 PPF was the only option other than EPF in the fixed income category which was not only eligible for tax deduction under Section 80C but also gave tax-free returns. Sukanya Samriddhi Yojna now joins the list. You can invest a part of your money meant for fixed income securities in the scheme as returns are better than after-tax returns from fixed deposits, non-convertible debentures (NCDs) and tax-free bonds. One can invest up to Rs 1.5 lakh in the scheme every year. Even if you have exhausted the Section 80C limit, you can still invest because returns are not taxed. This is especially true of those in higher tax brackets. For instance, if a person in the 30% tax slab invests in a bank fixed deposit offering 9.1% interest, his effective return after tax will be 6.3%. In Sukanya Samriddhi Yojna, it is 9.1%. If we consider the tax benefit, the effective yield for those in the 30% tax bracket is 13.17%. For PPF, it is 12.59%. The scheme, however, has a long tenure and minimum maturity period of 11 years. The money can be withdrawn only after the child turns 21. Premature withdrawal up to 50% is allowed for higher education or marriage of the girl after she turns 18. Inability to access the corpus is a negative. "The scheme certainly offers good returns compared to PPF but it cannot replace the latter simply because not everyone is eligible for investing in it. This is a new scheme and we have to see if it manages to attract enough inflows," says Vishal Dhawan, founder and chief financial planner, Plan Ahead Wealth Advisors. The government has also announced the launch of sovereign gold bonds as an alternative to investing in physical gold. The bonds will carry a fixed rate of interest and will be redeemable at the gold's 'face value'. While we don't know the structure of these bonds, it seems they will be like gold exchange-traded funds or ETFs. They will be pegged to the price of gold and also pay interest. Interest income and sovereign guarantee will make these an attractive investment, say experts. While each unit of gold ETF is backed by one gram of physical gold, sovereign bonds will not be backed by gold. This way their issuance will not involve import of gold. Gold imports are one of the reasons for the country's high current account deficit. The aim of the move is to curb gold imports. Should you invest? : Though there is need for clarity on a lot of points, from the look of it sovereign gold bonds look like another version of gold ETFs with both sovereign guarantee and interest income. Even if the interest rate is 2-3%, the bonds will be better than gold ETFs, which track the value of gold, which may go either way. "This is a potential threat to gold ETFs. We are yet to know how the final product will be but looks like it will give competition to gold ETFs," says Lakshmi Iyer, head of products, Kotak Mutual Fund. As far as taxation is concerned, debt instruments such as NCDs and tax-free bonds are more tax efficient than debt funds as profits from the former after one year are considered long-term capital gains and taxed at 10% without indexation and 20% with indexation. Profits from debt funds held for less than three years are considered short-term capital gains and taxed as per the individual's tax bracket. Long-term capital gains are taxed at 20% with indexation. If the same tax rule applies to gold bonds, they will become more tax-efficient than gold ETFs, which are taxed as debt funds. The government has abolished wealth tax and instead levied an additional surcharge of 2% on people earning more than Rs 1 crore a year. Wealth tax of 1% was levied on assets such as real estate, jewellery, car and yatch valued above Rs 30 lakh. But one residential property was exempt. Property used for business or given on rent was also exempt. The first set of people who gets 'relief' are those who were unaware that they are liable to pay wealth tax. This could lead to unintended consequences given that the income tax department has been tracking not just individuals' income but their assets as well. If caught on the wrong side of the law, you could have received income tax notices seeking a lot of information. The process could be cumbersome. "We have not seen many case where people have been served notices for non-payment of wealth tax, but the income tax department has become aggressive in capturing information about assets of individuals," says Dhawan of Plan Ahead. Then there were people who were aware of the wealth tax liability and had to go through a lot of trouble to get the jewellery, house, car, etc, valued. They will be saved from the hassle. There are many other smaller changes that will have a significant impact on your portfolio and the way you take investment decisions. For example, recurring deposit schemes, which were exempt from tax deducted at source (TDS), will attract TDS if annual interest payment is more than Rs 10,000. TDS is deducted at a rate of 20% if the depositor does not furnish his Permanent Account Number or PAN. Otherwise, tax is deducted at the prevailing rates. Earlier, during premature withdrawal from EPF, tax was deducted by the trustee of the fund. Now, the government has shifted the responsibility to employees. So, instead of full tax deduction, the trustee will deduct only 10% tax at the time of payment. However, if an individual is in 20% or 30% tax brackets, it will be his responsibility to pay the additional tax. The Budget has also made quoting of PAN mandatory for any purchase or sale exceeding Rs 1 lakh. These changes shift the accountability of compliance to individuals. Finance Minister Arun Jaitley has tried to clear the ambiguity over taxation of Real Estate Investment Trusts (REITs). Now, there will be no capital gains tax on exchange of shares of the special purpose vehicle (SPV), which will hold the assets, for units of REITs. This will not be regarded as a transfer. "In respect of REITs and infrastructure investment trusts, it is proposed to provide that the sponsor will be given the same treatment on offloading of units at the time of listing as would have been available to him if he had offloaded his shareholding of the SPV at the stage of direct listing," says Shrinivas Rao, CEO-Asia Pacific, Vestian Global Workplace Solutions, a real estate consultancy. "This will create an alternative funding opportunity for the sponsor since this tax treatment is on a par with raising of funds through IPOs," says Hemal Mehta, senior director, Deloitte India. The Budget has proposed that the rental income earned by REITs from owning assets directly will be considered a pass-through and will be taxable in the hands of unit holders. However, experts believe there is still ambiguity over applicability of minimum alternate tax and dividend distribution tax. In last year's budget, a step was taken to encourage REITs by providing them partial pass-through status. REITs were notified in September last year. But experts were worried about the ambiguity in taxation status. The taxation framework for REITs introduced in 2014 resulted in deferral of tax on capital gains from transfer of shares of an asset-holding SPV to REIT in exchange for units of REITs until disposal of the relevant REIT units. REITs pool in money from different people, just like mutual funds, and invest in properties that generate income. The units are listed on exchanges and traded like stocks. They invest in revenue generating commercial properties such as shopping malls and office buildings. They provide small investors an option to invest in commercial real estate, which is otherwise difficult due to the high investment involved. The price of one unit of REIT is Rs 2 lakh. REITs will bring liquidity in the real estate sector by helping developers raise funds. They will also provide an exit option to investors like private equity and venture capital funds.